Minoxidil for Hair Growth: What is the Best Brand? What minoxidil brand is the most effective for promoting hair growth? Minoxidil is one of only two FDA approved hair loss treatments in the United States, and the only FDA approved treatment for men and women. The other is finasteride (branded as Propecia - a pill for men only). Minoxidil comes in two main forms, a liquid and a foam. Minoxidil can be bought under a number of different brands, the most well-known being Regaine (Rogaine in the US). Men and women can use minoxidil, however, the recommended strength for men should not exceed 5%, and for women it should be a maximum of 2%. Women who are pregnant or breastfeeding should avoid using this treatment. Minoxidil can be purchased under countless brands, but all the treatments should have exactly the same effect. 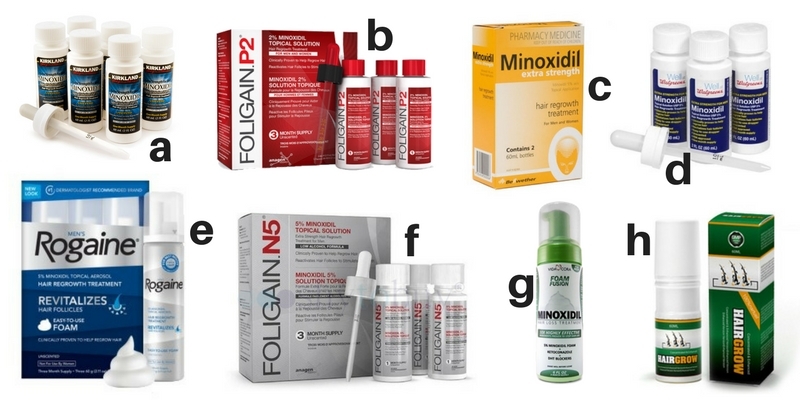 Brands such as Kirkland (a) offer users a cheaper alternative to expensive brands like Regaine/Rogaine (e) and Foligain (b,f). What is more effective: Liquid or Foam? Again, it should not matter what brand or texture of minoxidil you use, whether it is liquid or foam, as long as it is minoxidil, it will all work to the same effect. Foam is more popular because it tends to try almost instantly, whereas the liquid can take up to an hour to dry out, making the hair look greasy and flat. Does minoxidil really stimulate hair growth? Minoxidil is not a cure for baldness, but it does stimulate hair growth, particularly in sufferers of early stages of hair loss and thinning hair. Results vary with each individual, with some users experiencing new hair growth after just two months. Other users did not see clear results until two years of using the treatment. Minoxidil can be a long waiting game, so patience is absolutely key. Minoxidil can also be used in conjunction with potent hair vitamins or hair stimulating serums and shampoos. However, as a precautionary measure, be sure to check with your doctor before mixing potent treatments.